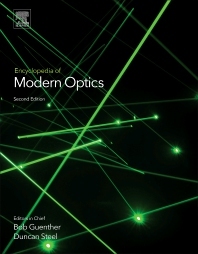 The Encyclopedia of Modern Optics, Second Edition, provides a wide-ranging overview of the field, comprising authoritative reference articles for undergraduate and postgraduate students and those researching outside their area of expertise. Topics covered include classical and quantum optics, lasers, optical fibers and optical fiber systems, optical materials and light-emitting diodes (LEDs). Articles cover all subfields of optical physics and engineering, such as electro-optical design of modulators and detectors. This update contains contributions from international experts who discuss topics such as nano-photonics and plasmonics, optical interconnects, photonic crystals and 2D materials, such as graphene or holy fibers. Other topics of note include solar energy, high efficiency LED’s and their use in illumination, orbital angular momentum, quantum optics and information, metamaterials and transformation optics, high power fiber and UV fiber lasers, random lasers and bio-imaging. Professor Bob D. Guenther is Adjunct Professor in the Department of Physics at Duke University, Durham, NC, USA. He uses femtosecond pulsed laser systems to study ultrafast phenomena. Current research includes characterization of quantum well devices, development of terahertz electronics, and analysis of bunched relativistic electron beams. Because these projects are of fundamental interest to physicists, engineers, and material scientists, Prof. Guenther's research involves collaboration with other departments at Duke and other major universities. He is presently working on the application of femtosecond technology to the study of solids, the development of terahertz sources, and new measurement techniques associated with electron beams. He has used a Michaelson Interferometer to observe the temporal characteristics of the electron-beam used in the FEL. Professor Duncan Steel is Robert J. Hiller Professor of Engineering at the University of Michigan, Ann Arbor, MI, USA. He received his undergraduate degree from UNC-Chapel and his graduate degrees in Electrical and Nuclear Science from the University of Michigan. Professor Steel has worked for General Electric, Exxon, and Hughes Research Labs (senior staff physicist) and joined the faculty of Electrical and Engineering and Computer Science and Physics at the University of Michigan in 1985. He was the Area Chair for Optical Science for 19 years, Chair and Director of Biophysics for 2 years. He currently leads two laboratories at the University, one focused on the use of lasers with quantum dots in quantum information and the other using advanced microscopy and spectroscopy to understand the molecular basis of cellular toxicity from amyloid beta in Alzheimer’s Disease. He is a Fellow of the Optical Society of America, the American Physical Society and the IEEE and received the 2010 Isakson Prize from APS for his work on laser spectroscopy in condensed matter physics.